I love using body oil in place of body lotion. I think its easier and more effective at moisturizing, especially early in the morning. I’ve used so many over the years, usually really inexpensive ones from Whole Foods, like jojoba or sesame oils. But sometimes I like to use one thats a bit more luxurious and special. The folks at S.W. Basics of Brooklyn must be reading my blog because a) I love lemongrass and b) I love body oils. The Lemongrass Body Oil from S.W. Basics is really quite special. Its made (in Brooklyn!) 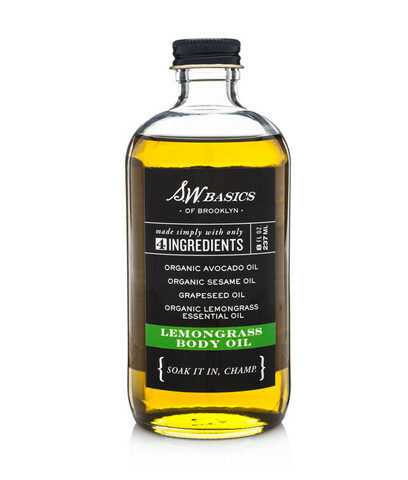 with only four ingredients, organic grapeseed, organic avocado & organic sesame oils and organic lemongrass essential oil. First it smells incredible, in that lemongrass way and not at all cloying. The scent does not last too long, but just long enough to reap the benefits of a citrus scent in the morning (a scent that I’m convinced makes you a happier person). Even though its an oil, it dries really fast and I can get dressed pretty much right away. Usually, I put body oil on in the shower, but this container is glass and didn’t have a spout or a dispenser like control device on it (FYI they do make one bottle with a pump-I’d advise picking that one up) so I put it on outside the shower. With oils in the past that dispense fast I’ve wasted a lot of product, but with this oil a little bit does go a long way, and I’m able to just press the bottle into my hand and that is enough to cover an area. If your thinking about a body oil and something to make your everyday morning routine a bit more spa like, I’d really recommend picking this gem up. Even more incentive, S.W. Basics of Brooklyn is offering One Product readers a 15% discount for the next three days with the code ONEPRODUCT15. You can read my other reviews of their amazing,organic, handcrafted products here and here!